(Matt Agorist) On Monday night, a tragedy unfolded in Manchester, England, as a suicide bomber walked into the Manchester Arena and detonated a bomb at the southern entrance. The Islamic State claimed responsibility on Tuesday for the bombing which is the deadliest assault in Britain since 2005 — as the death toll rose to 22. This cowardly murderer is responsible for the deaths of innocent children, one of which was as young as 8-years-old. According to reports, the attacker allegedly had support from a local group. 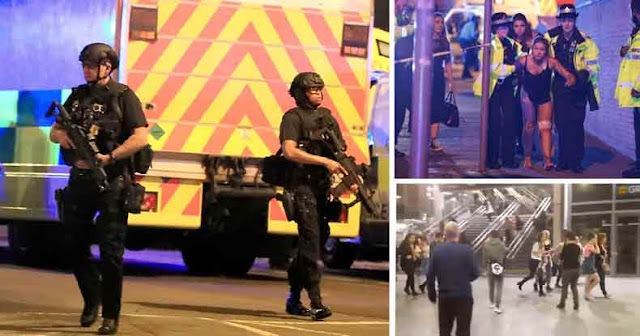 As the NY Times reports, hours after the attack, the police set off a controlled explosion and raided a house in Elsmore Road, in the Fallowfield district, about 3.5 miles south of the arena. The ISIS attack was immediately decried by Western officials as they took to the airwaves to release their statements. “We now know that a single terrorist detonated his improvised explosive device near one of the exits of the venue, deliberately choosing the time and place to cause maximum carnage and to kill and injure indiscriminately,” Prime Minister Theresa May of Britain said in a televised statement. “So many young, beautiful, innocent people living and enjoying their lives murdered by evil losers in life,” President Trump said early Tuesday morning. “I won’t call them monsters because they’d like that term. They’d think that’s a great name,” he added. The remarks from Trump and May are certainly warranted and ring true on all levels. Trump’s statement about peace never taking root “in an environment where violence is tolerated, funded and even rewarded,” rings especially true. However, it also exposes the dark hypocrisy of the United States and their constant support of terror for the advancement of special interests. Before assuming that the Free Thought Project is using this tragedy to advance an agenda, consider that we are only providing a solution to a problem to prevent future attacks. Make no mistake, Western officials are already planning to use this attack to usurp freedoms in the name of ‘keeping you safe.’ We simply propose a far more effective solution that does not involve fostering the police state. If Trump truly meant that peace can only come when terrorism is not funded and rewarded, then he wouldn’t have just struck a $360 billion dollar deal with the world’s largest exporter of terrorism in the world, Saudi Arabia. As the Free Thought Project reported last year, a leaked Hillary Clinton email showed the US-backed regimes in Saudi Arabia and Qatar have long supported ISIS. Prior to the election, Trump agreed, and, on several occasions, lambasted the Saudis for their role in 9/11 and exporting terror. All Trump’s rhetoric on Saudi Arabia, however, has now shifted as he curtseys to them like every recent president before him. It’s not just the US support of Saudi Arabia that makes Trump’s statements on the Manchester bombing hypocritical — it’s the fact that the US, itself, is continuing to aid terrorism in the Middle East. As the Free Thought Project reported earlier this year, the problem of the US funding terrorism in Syria has become so large that the mainstream media cannot even keep it under wraps. Even politicians have come forward with bills to outlaw US funding of terrorism. “Stop Arming Terrorists Act,” or HR 608, would ban the use of US taxpayers’ funds to aid terrorist groups affiliated with Al-Qaeda or Islamic State (IS, formerly ISIS/ISIL). “For years, our government has been providing both direct and indirect support to these armed militant groups, who are working directly with or under the command of terrorist groups like Al-Qaeda and ISIS, all in their effort and fight to overthrow the Syrian government,” Congresswoman Tulsi Gabbard said in an interview in March. During her visit to Syria in January, Gabbard met with refugees and victims of the US-backed Syrian regime change, who all asked the same question — why is the US funding terrorism. Gabbard is not alone in calling out the US government’s role in funding ISIS either. Senator Rand Paul, in March, also announced the senate’s version of the same bill. As Trump pays lip service to the victims of the Manchester bombing, his words ring hollow as long as he continues to support the Saudis and continues the same strategy in Syria as his predecessor, Barack Obama, of arming terrorists. Despite his common sense approaches before being elected, Trump now shows no signs of implementing solutions that will prevent future terror attacks. Instead, through arming and funding them — while simultaneously and indiscriminately blowing up innocent children across the Middle East — Trump is guaranteeing a dark future filled with death and destruction.